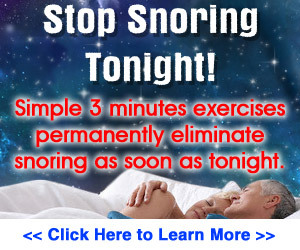 This site, BestWaytoStopSnoring.com may contain information on and links to medical topics related to stopping snoring; however, no warranty whatsoever is made that any of the information is accurate. There is absolutely no assurance at all that any statement contained or cited in the site, or any associated page, about or touching on medical matters is true, correct, precise, or up-to-date. Most of the information is written, partly or wholly, by nonprofessionals and even if a statement made about a medical matter is accurate, it does not necessarily apply to you or to your particular case or symptoms. This site is not written or overseen by a doctor and does not provide medical advice; and nothing on this site, or related pages, or related in any way to this site should be taken as an attempt to offer or render a medical opinion or otherwise engage in the practice of medicine. No responsibility is taken for any results or consequences of any attempt to use the information, services or products mentioned on these pages. Any medical information provided on BestwaytoStopSnoring.com is, at best, of a general nature and is not a substitute for getting advice from a medical professional such as a qualified doctor/physician, nurse, pharmacist/chemist, etc. You should always consult your medical practitioner if you are thinking of making use of any advice, services, products or any other information or links found on these pages or by following such links. We cannot advise you on your use of any product, service or information, etc., available from these pages. You should use your own best judgement when deciding whether or not to use anything available from this site or by following links from this site.